WASHINGTON (AP) - Glued to high-stakes testimony on his Supreme Court nominee, President Donald Trump and his allies were shaken by Christine Blasey Ford's emotional appearance on Capitol Hill Thursday, but heartened by Judge Brett Kavanaugh's forceful pushback against the woman who accused him of sexual misconduct. Trump missed hardly a moment of the proceedings, relying on DVRs to keep up on the Senate Judiciary Committee hearing Thursday from his private office on Air Force One as he traveled from New York to Washington, and continued monitoring back at the White House, where Ford's voice echoed from TVs around the building. Within moments of the eight-hour proceedings concluding, Trump tweeted his approval of Kavanaugh's performance and called on the Senate to move swiftly to a vote. "His testimony was powerful, honest, and riveting," Trump said. "Democrats' search and destroy strategy is disgraceful and this process has been a total sham and effort to delay, obstruct, and resist. The Senate must vote!" At a GOP fundraiser at his Washington hotel later Thursday, Trump described the hearing as "brutal" and "hard to watch" but praised Kavanaugh's performance. He described Kavanaugh as a "great guy" and a "great man," according to an attendee who spoke on condition of anonymity because the person was not authorized to describe Trump's speech publicly. Ford's tearful recounting of allegations that Kavanaugh sexually assaulted her when they were in high school, led Trump to express sympathy for Kavanaugh and his family for having to listen to the testimony, according to two Republicans close to the White House but not authorized to speak publicly about private conversations. They added that Trump expressed some frustration at the process - and the staff work - that led Kavanaugh to this point. After seeing Ford's powerful testimony, White House aides and allies expressed concern that Kavanaugh, whose nomination already seemed to be teetering, would have an uphill climb to deliver a strong enough showing to match hers. White House officials believe Kavanaugh's passionate denials of Ford's claims, including the judge's tearful description of the impact the accusations had on his family, met the challenge. A White House official who was not authorized to speak publicly said the West Wing saw the judge's opening statement as "game changing" and said Trump appeared to be reacting positively. Signaling the continued White House support for Kavanaugh, spokeswoman Sarah Huckabee Sanders tweeted praise for Sen. Lindsay Graham after the South Carolina Republican railed against Democrats, accusing them of treating Kavanaugh "despicably." Sanders tweeted that Graham "has more decency and courage than every Democrat member of the committee combined. God bless him." Trump's son, Donald Jr., also tweeted his review: "I love Kavanaugh's tone. It's nice to see a conservative man fight for his honor and his family against a 35 year old claim with ZERO evidence and lots of holes that amounts to nothing more than a political hit job by the Dems." 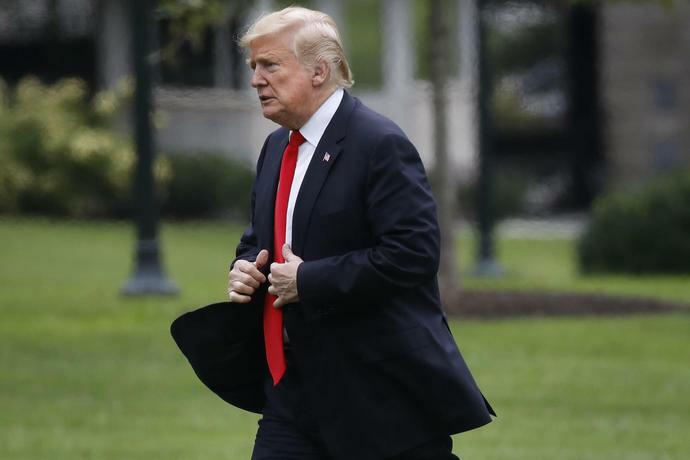 Going into the hearing, Trump had grown increasingly frustrated, angry at members of his staff - and, in particular, White House counsel Don McGahn - for not better managing the confirmation process for his second Supreme Court nominee. McGahn, who is set to depart his post in coming weeks, had advocated for Kavanaugh, seeing his confirmation as the crowning achievement of his tenure - and part of a decades-long effort to install more conservatives on the high court. Trump has also criticized Republican leaders in Congress for not speeding the process along, leading to days' worth of revelations against Kavanaugh. White House aides have bemoaned the drip-drip-drip nature of the emerging allegations and thought a faster process could have avoided Ford's testimony. How the proceedings were playing out on television was a key anxiety. Some White House officials were not pleased with the questioning from Phoenix prosecutor Rachel Mitchell, saying she did not effectively target the weak spots in Ford's narrative and worrying that the Democrats had seized the moment. Trump has also told allies that he wished Kavanaugh's Fox News interview Monday had gone better, believing it was a missed opportunity to change the momentum around the story, according to the two Republicans and another outside adviser. And White House allies noted the importance of how Fox would cover the proceedings in shaping Trump's reactions.